There is plenty of research to show that movable alphabets are a very effective literacy teaching tool. This video clip shows you how to use the movable alphabet that's available from this website as a downloadable pdf which you print, laminate and cut up, so it's super-affordable and there's no waiting for it to arrive by post, plus you can make a set for home and one for school if necessary, for consistent teaching and practice. This alphabet contains 100 spellings of either one, two, three or four letters. These are the main spellings in one-syllable words. There are additional spellings in longer words, but these are best avoided when working with beginners. Each spelling includes example words, e.g. the spelling "oe" has the words "toe", "shoe" and "does" on it. These words are useful to remind teachers/parents and learners that most spellings are shared by more than one sound. Click here to go to the store and get your copy. 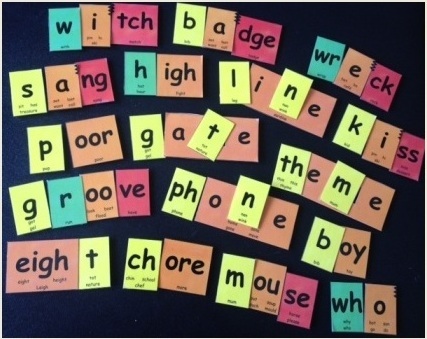 This entry was posted in blending and segmenting, consonants, phonics activities, sound-letter links, sounds, spellings, teaching strategies, vowels, word attack on June 29, 2012 by alison.